Information in PPTX files is stored in compressed format. PPTX or PresentationML is an archive with information stored in ZIP file format with multiple subfolders which contain XML files with presentation data, metadata and attachment files like images, etc. PPTX structure is outlined in OOXML standards ECMA-376 and ISO/IEC IS 29500:2008. Below is a typical PPTX file structure in an uncompressed format. Uncompressing PPTX file is quite easy. All you need to do is to change its file extension to ZIP and extract this ZIP file contents. PPTX file fully matches ZIP format specification and any unarchiver will be able to extract it. 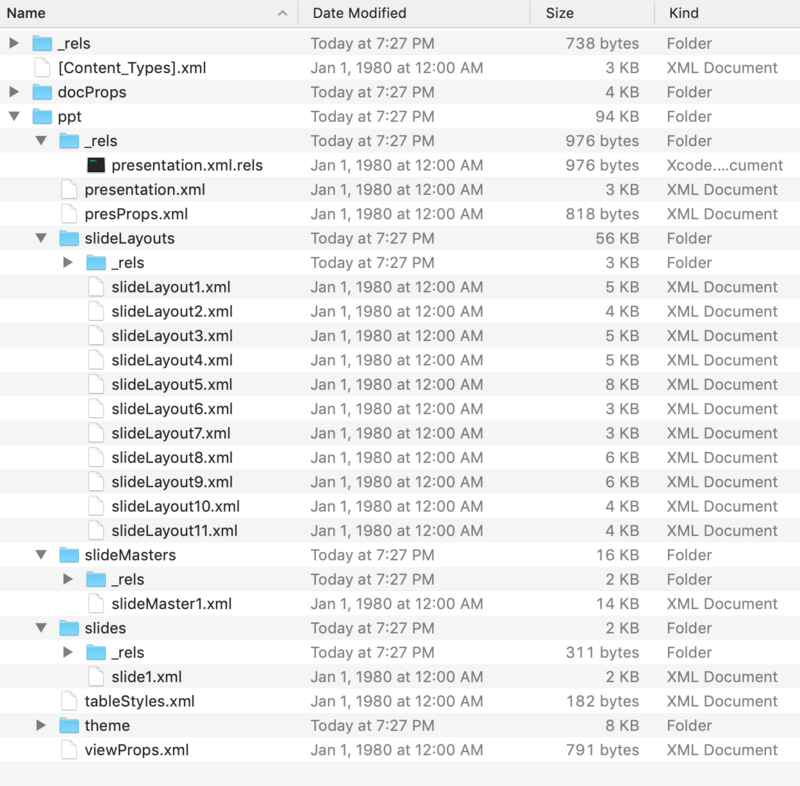 Presentation.xml.rel – contains relationships of presentation to the other parts of the content such as slideMaster1.xml, notesMaster1.xml, handoutMaster1.xml, slide1.xml, presProps.xml, tableStyles.xml, theme1.xml, as well as the URIs for external links. presProps.xml – contains presentation properties. “slideLayouts” folder – contains information about presentation slides layout. Theme1.xml – information about presentation theme. Theme can contain information about fonts, format schemes, color schemes and more. Information about an application which was used to create PPTX document and its author is stored in “docProps” folder. PPTX can contain different files but every PPTX file must contain [Content_Types.xml] file in its root folder. [Content_Types.xml] describes all content files stored in the PPTX compressed package.